Charlotte is a great town for kids, with plenty of inside and outside attractions to keep them busy and engaged. Most attractions are inexpensive, but let’s talk about the free ones. Here’s a list of ten FREE things for kids to do in the Charlotte area. So whether you’re planning for a visit from nieces or nephews, or you’re looking for fun things for your own kids to do, start here. And if you haven’t subscribed to Charlotte on the Cheap by email you can do that now. You’ll receive one email a day. It’s free! ImaginOn: Any discussion of free things for kids to do in Charlotte has to start with ImaginOn, the joint venture of Charlotte Mecklenburg Library and Children’s Theatre of Charlotte. There’s a cost involved in seeing the Children’s Theatre shows, or taking theater classes, but there’s a whole lot of free stuff to do too. Teens have a whole floor to themselves. Studio I provides the means for teens and families to create stop motion animation and other films. Preschoolers can dress up in costume and stage their own shows. Even the outside of the building has become an attraction, with kids jumping from one huge typewriter key to another. I’d bet that there are more than a few Charlotte kids who learned to spell their names from playing on those keys. Bonus: Cross the light rail tracks and enjoy lunch or cupcakes at 7th Street Public Market. And show your kids those light panels on the outside of the 7th Street Station. When they push them, the panels will light up and produce fun sounds. Greenways: The 37 miles of developed Greenways and 150 miles of undeveloped Greenways are undeniably a hidden treasure. These paths, perfect for walking or biking, run along creeks throughout the county. They connect neighborhoods and other points of interest. Kids love how they’re sort of hidden. As you drive on busy W.T. Harris Boulevard, you might never guess you’re passing over a tunnel where kids are riding their bikes, on their way to play by a creek. Bonus: Little Sugar Creek Greenway, in the most urban of any of the Greenways, is now home to the Trail of History, a growing collection of bronze sculptures immortalizing important figures in Charlotte history. Little Sugar Creek Greenway always leads to the Metropolitan, a shopping area that hosts free evening concerts. Romare Bearden Park: The newest gem in Uptown Charlotte, the beautiful Romare Bearden Park features a huge field for throwing a frisbee, lighted water features and a stunning skyline view. Visit the park for holiday parties throughout the year, concerts and festivals. Bonus: Before every Carolina Panthers’ home game, Romare Bearden Park hosts “Panthers in the Park,” where kids can take part on football drills, meet Sir Purr, the Panthers’ mascot, and listen to PurrCussion, the Panthers’ drumline. U.S. National Whitewater Center: No, the water sports, climbing and zip lines aren’t free, and there is a charge for parking ($5/car), so I expect some will protest the Whitewater Center’s inclusion on this list. But it belongs here because of all that is free: possibly the best mountain biking in the city, on 20 miles of trails that are also good for running. If you have your own kayak, there’s no charge for putting it into the Catawba River. In the summer there’s open swimming once a week. In addition, twice-weekly concerts in the spring, summer and fall, as well as festivals, bring world-class artists to the Whitewater Center, again for free. Bonus: Set up next to the channel and watch the rafters battle the whitewater. It’s fun to watch them conquer it and stay in the boat, but admit it: it’s more fun to watch them fall out. Art Museums: Both Mint Museum and Bechtler Museum of Modern Art have regularly scheduled free days for kids. On those days, adults are usually half price. What’s more, the museums provide hands-on activities and special programming for families that relate to current exhibits. Look for Bechtler Family Days and Mint Museum Sunday Fun Days. Bonus: Outside the Bechtler Museum is the Firebird sculpture, which is possibly the most popular photo op in the city. Across the street is The Green, a small park popular with families. It’s got some interesting features, including fountains, mosaic benches and whimsical signs. It’s also the site for the free Charlotte Shakespeare Festival in the summer. Nature Centers: Mecklenburg Parks and Recreation boasts three nature centers, McDowell, Reedy Creek and Latta Plantation. All three are free, have animals and much more for kids to explore, and host fun, educational programs all year, even campfires at night. Each one is situated in a nature preserve, so provide plenty of opportunity to really get into nature. Spraygrounds: In the summer months, nothing is more welcome to kids than cooling down. Mecklenburg County Parks and Recreation maintains five spraygrounds and they’re all free to use. They’re open from Memorial Day to Labor Day from 10:00 a.m to 8:00 p.m. Bonus: The county also maintains two outside pools. Admission is just $1/person all summer, and free swimming lessons are offered. 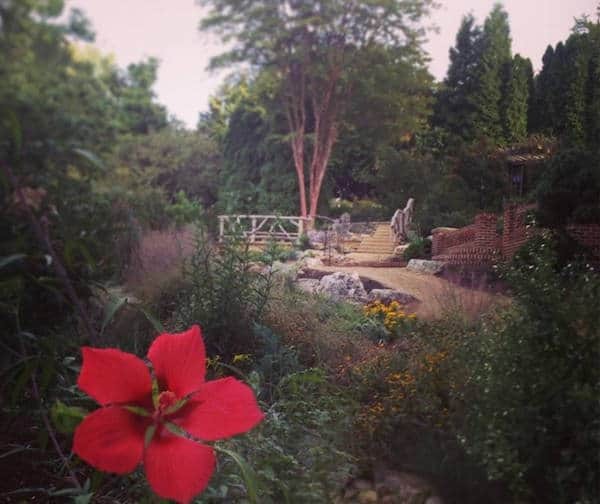 UNCC Botanical Gardens: Many parents don’t know about this free resource, or might not know if it’s appropriate for kids. It is. Paths wind around Asian gardens, a butterfly garden, a waterfall pond, a 120 year old cabin and so much more. This is a place that will ignite kids’ imagination. Botany classes are also offered to both kids and adults. Bonus: The MacMillan Greenhouse’s most famous resident is Bella, the Titan Arum. This giant plant blooms so rarely, just twice in her life so far, that it’s a major event when she does, and visitors line up to smell her. Yes, “smell.” That’s what makes her famous, the pungent aroma when she blooms. Find out all about this week’s free events. Learn about the free days at local museums. See a big list of local thrift shops and consignment shops. See the most recent posts on Charlotte on the Cheap for kids’ events. See a list of restaurants where kids eat free. Browse a big list of today’s Charlotte daily deals from Groupon, LivingSocial, etc.